New Year’s resolutions are not for everyone- a little like the British delicacy of marmite, they seem to be something that you either love or hate. But, if you are in the habit of making them, it is usually around this time that you might stop and take account of how your New Year’s resolutions are holding up. Whilst I often eschew the resolution-making mania, this year I thought it could be fun to set myself a New Year’s tea resolution. There were a host to choose from, but I finally settled on one and thought it was about time to check in on it. 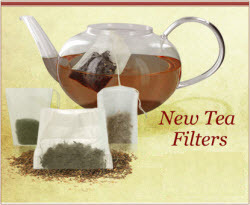 My New Year’s tea resolution was to invest in some tea filter bags (such as these or these) so that I can improve my tea options when I am out and about all day. I make frequent use of my thermos, but since it does not have an infuser I end up grabbing one of my teas in teabag form as I head out the door. Now, don’t get me wrong- there are some very nice teas to be found in bagged form that I enjoy drinking. However, these (for my tastes and preferences) tend to be black teas. And while I am often looking for a nice strong cup of black tea in the afternoon (usually PG Tips or Barry’s), sometimes a gentler green tea or oolong tea is in order. My options therefore usually involve a sub-standard green bagged tea, which I have to buy at a café that doesn’t really understand how to make it. This is unnecessary on two counts, considering that I have a perfectly good stock of loose teas at home and could make them much better myself. This is where the tea filter bags come in- they would allow me to pre-bag some of my nice loose teas to take with me, and would give me some more options for tea on the go. Of course, buying the filters is the easy part. The harder part is actually changing my habits and routines to start using them effectively. However, at over half a month in, I think I am doing pretty well. I set aside an afternoon to pre-bag a range of my loose teas (I like options) and have these bags in tins (they still need to be kept fresh!). Now when I’m heading out the door I have some choices, and often I take a couple along, just in case my preference changes half-way through the day. So far so good- we’ll see how it goes from here! Should You Stir, Swirl, or Dunk During Tea Steeping?